This savory appetizer is made by quickly stir-frying baby clams with fresh herbs and serving with your favorite chips. You can also serve on crusty bread similar to bruschetta. If you’re looking for something different to try, here’s a tasty and unique dish. How about making this for your next party or get-together? Drain clams using a sieve and discard excess liquid. Use a hand food chopper to crush the peanuts. Alternatively, place peanuts in a small resealable plastic bag and crush using a rolling pin or meat mallet. Slice the onion into thin strips and chop green scallions into small pieces. 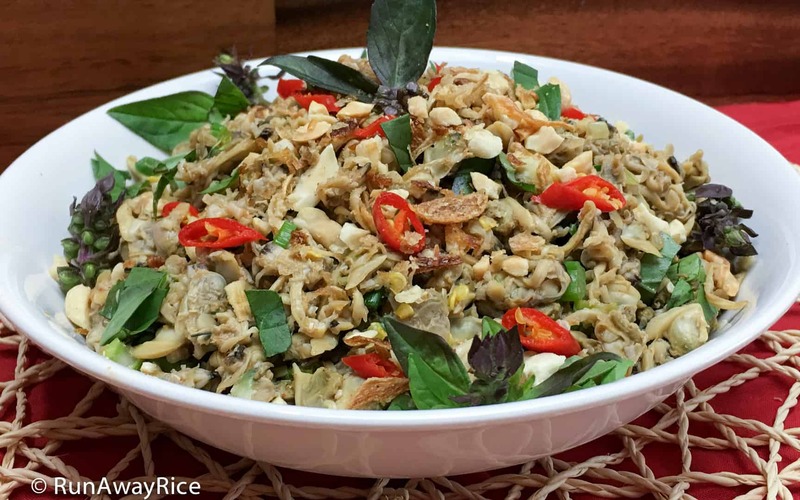 Coarsely chop Thai basil and Vietnamese coriander. Red chilies are optional. Leave them whole if you want to use as a garnish. Slice them if you plan to eat them. Heat a wok over Medium heat. When hot, drizzle olive oil into the pan. Add sliced onions and stir-fry for 2-3 minutes. Add baby clams and stir-fry for 2 minutes. Add the seasonings: fish sauce, oyster sauce, black pepper and paprika. Stir to combine everything well. Add the scallions and stir-fry for another minute. Turn off the heat. Add the fresh herbs, fried onions and half of the crushed peanuts. Stir together one last time. 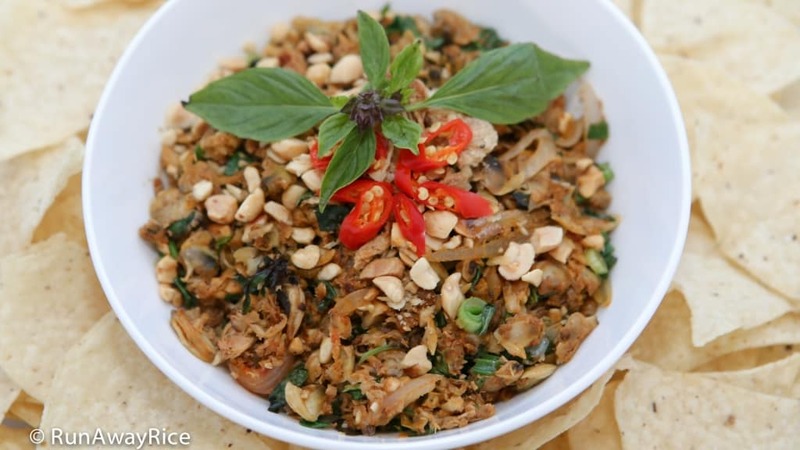 To serve, garnish with fresh herbs, red chilies and remaining peanuts.